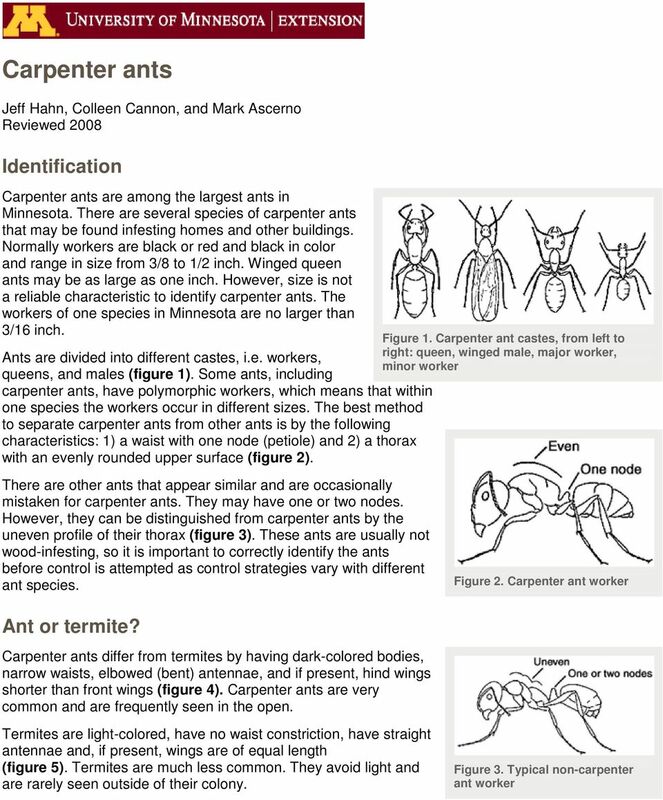 Download "Carpenter ants. Identification. Ant or termite? Jeff Hahn, Colleen Cannon, and Mark Ascerno Reviewed 2008"
2 What they eat Carpenter ants feed on sources of protein and sugar. Outdoors, carpenter ants feed on living and dead insects. They are also very attracted to honeydew, a sweet liquid produced by aphids and scale insects. Aphids and scales feed on trees, shrubs, and other plants. Indoors, carpenter ants feed on meats, as well as syrup, honey, sugar, jelly, and other sweets. Carpenter ants DO NOT eat wood. They remove wood as they create galleries and tunnels. Most foraging is done at night between sunset and midnight during spring and summer months. Sometimes workers travel up to 100 yards from a nest in search of food. Figure 4. Winged carpenter ant Where they live Carpenter ants nest in moist wood including rotting trees, tree roots, tree stumps, and logs or boards lying on or buried in the ground. They can also nest in moist or decayed wood inside buildings. Wood decay may be caused by exposure to leaks, condensation, or poor air circulation. Nests have been found behind bathroom tiles; around tubs, sinks, showers, and dishwashers; under roofing, in attic beams, and under subfloor insulation; and in hollow spaces such as doors, curtain rods, and wall voids. Carpenter ants may also nest in foam insulation. A parent carpenter ant colony sometimes establishes one or more satellite nests in nearby indoor or outdoor sites. Satellite nests are composed of workers, pupae, and mature larvae. A satellite nest does not require moisture because the workers do not tend eggs (the eggs would dry out without sufficient humidity). For this reason, satellite nests can be found in relatively dry locations, such as insulation, hollow doors, and sound wood. The workers of satellite colonies move readily between their nest and the parent colony. In late summer, winged reproductives (i.e. queens and males) may emerge from pupae transported into satellite colonies. They may appear in structures in late winter and early spring as they swarm from a satellite nest. Damage Carpenter ants damage wood by excavating and creating galleries and tunnels. These areas are clean, i.e. they do not contain sawdust or other debris, and are smooth, with a well sanded appearance (figure 6). Figure 5. Winged termite The damage to wood structures is variable. The longer a colony is present in a structure, the greater the damage that can be done. If structural wood is weakened, carpenter ant damage can be severe. Figure 6. Damage caused by carpenter ants. Note smooth tunnels and lack of sawdust or frass. 4 wilt. Also, prune branches that touch electrical lines or other wires that are connected to the house; carpenter ants can travel from branches to lines and use them like a highway to buildings. Detection In order to eliminate carpenter ants nesting indoors, you need to locate and destroy their nest. The nest may be located by careful and patient observations of worker ants, especially between sunset and midnight during spring and summer months when carpenter ants are most active. To follow carpenter ants without startling them, use a flashlight with a red film over the lens ants cannot see red light. You can increase your chances of following workers to their nest by setting out food that is attractive to carpenter ants. Place food in areas where you find workers. Many foods are attractive to carpenter ants, including honey or other sweet foods. During spring, carpenter ants are particularly attracted to protein sources, such as tuna packed in water. (Carpenter ants are not attracted to tuna packed in oil.) Set out small pieces of tuna for the ants to take back to their nest. It is easier to follow the ants when they are carrying food. With patience and perseverance, you can follow the ants back to their nest. Other signs that indicate an active nest is nearby include small piles of coarse sawdust or wood shavings, consistent indoor sightings of large numbers of worker ants, i.e. 20 or more, and large numbers of winged ants indoors. Carpenter ants typically swarm from late winter through spring. Also pay attention to areas where steady moisture is or has been a problem; firewood stored in an attached garage, next to the foundation, along an outside wall, or in a basement; areas around the plumbing or vent entrances; and trees with branches overhanging the house. 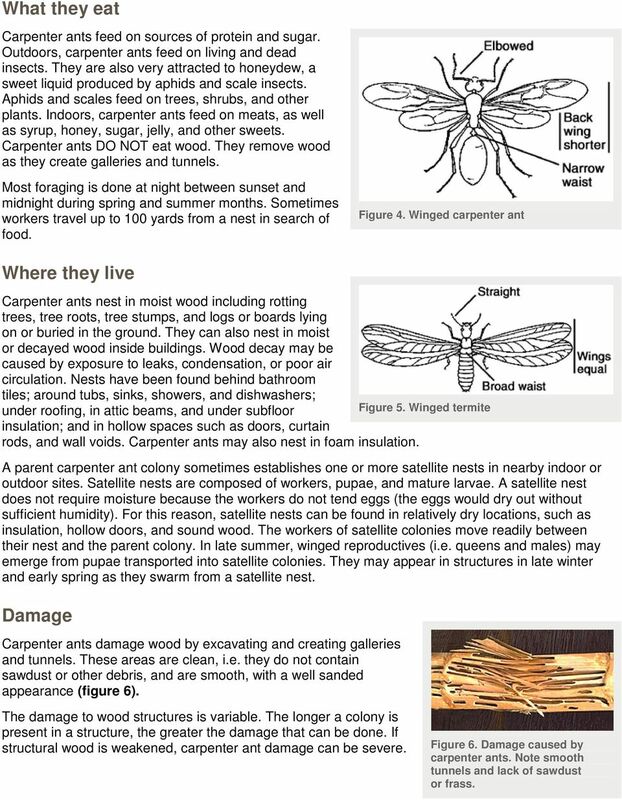 These are possible sources of carpenter ant nests. Sound detection may be helpful in locating a nest. An active colony may make a dry, rustling sound that becomes louder if the colony is disturbed. This sound, thought to be a form of communication, is made with the mandibles (jaws) and is not related to wood chewing. When trying to detect carpenter ants, tap the suspected area and then press an ear to the surface in order to hear any sound. If one nest is found, watch for evidence of additional nests. More than one nest may be present in a structure. Control The best method to control carpenter ants is to locate and destroy the nest, replace damaged or decayed wood, and, if they exist, eliminate moisture problems. Eliminating a carpenter ant nest is a difficult and challenging task. It is possible for a home dweller to control carpenter ants on their own. However, in most cases, control should be performed by an experienced pest control applicator. They have the experience and a wider array of products to more effectively control a carpenter ant problem. Home dwellers can still play a crucial role in control programs by providing information to a pest control provider, such as when, where, and how many ants were seen. Indoors Nests are often concealed in wall voids, ceilings, subfloors, attics, or hollow doors. It is usually necessary for a professional pest control applicator to drill small (about 1/8 inch) holes and apply an insecticidal dust into the nest area. It is best to determine the nest s location as specifically as possible. Control should not be applied randomly through the home. There are no insecticides available to the public that are labeled for this type of application. 5 If it is difficult to locate the nest, an insecticidal dust can be applied into wall voids through electrical outlets. Carpenter ants commonly travel along electrical wiring and are likely to encounter the insecticides. This method works more slowly than a direct treatment into the nest. Boric acid is available to home dwellers to treat wall voids through electrical outlets. CAUTION: Use extreme care around electrical wiring and take all necessary steps to avoid accidental electric shocks. If the nest is exposed (e.g. due to remodeling or reroofing) you can use a liquid or aerosol ready-touse insecticide, such as bifenthrin, cyfluthrin, deltamethrin, or permethrin. Spray the insecticide directly into as much of the nest as possible. The more of the colony that is exposed, the better your chance of destroying it. It is necessary to anticipate a carpenter ant colony and have a product ready at the start of construction. Once the nest is exposed, that portion of the colony will try to relocate to protect themselves. Sprays on surfaces where ants travel or congregate, such as along baseboards or in holes or cracks in the walls and floors, may reduce the frequency and number of ants you see. However, they are not effective in eliminating a nest because 1) the ants carry very little insecticide back to their nests and 2) most ants forage outside and do not come in contact with the insecticides. Be aware of the potential for more than one nest in a building, but only treat nests that you know exist. Do not treat areas of a building if additional nests are not found. Once a carpenter ant nest is treated, continue to watch for evidence of an active nest until the following spring. If no evidence is observed, then further insecticide applications are unnecessary. Baits If the nest cannot be located, baits may be an effective alternative. Baits work by combining an attractive food source with a slow-acting toxicant. A delayed toxicant is critical because it allows the ants to forage normally for days or even weeks. During that time, ants consume the bait and return to the nest to share the bait with the rest of the colony. In a process known as trophallaxis, one ant regurgitates its stomach contents to another ant. This food sharing behavior enables the bait to be spread throughout the colony before the toxicant takes effect. 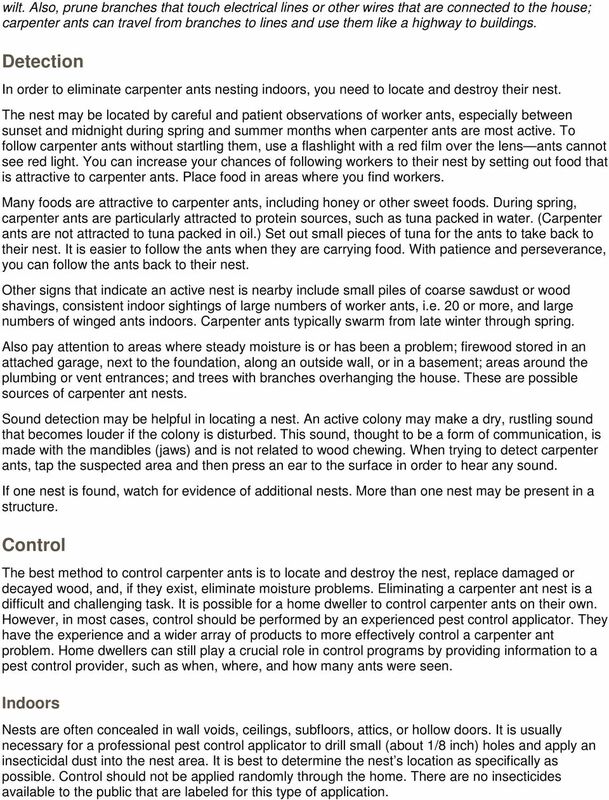 There are a few baits available to nonprofessionals for carpenter ant control. Most retail products are liquid or granular formulations containing hydramethylnon, sulfluramid, abamectin, or boric acid. Baits vary a great deal in their effectiveness. Carpenter ants have complex food preferences, and some of the sugar-based baits will not be attractive to the ants long enough to be successful. The keys to successful baiting are placement and monitoring; a bait cannot be effective if it is never encountered by ants. Place the bait only in areas where activity has been seen or is strongly suspected. After offering the bait, monitor it over 24 hours for feeding activity. Any bait that is ignored should be substituted with another, and any that is consumed should be replenished. Remember that increased ant activity around baits is a good sign. Never apply insecticides on or around baits because this will prevent feeding and render baits useless. Do not spray or dust other areas of the home, especially where carpenter ants are seen, as this can reduce the effectiveness of the bait. Be patient baits can take weeks or months to achieve control. Professional pest control personnel are trained in baiting techniques and have access to a wider variety of products than consumers. They are more likely to achieve positive results. Contact a licensed pest control company if you prefer the expertise and experience of a professional. 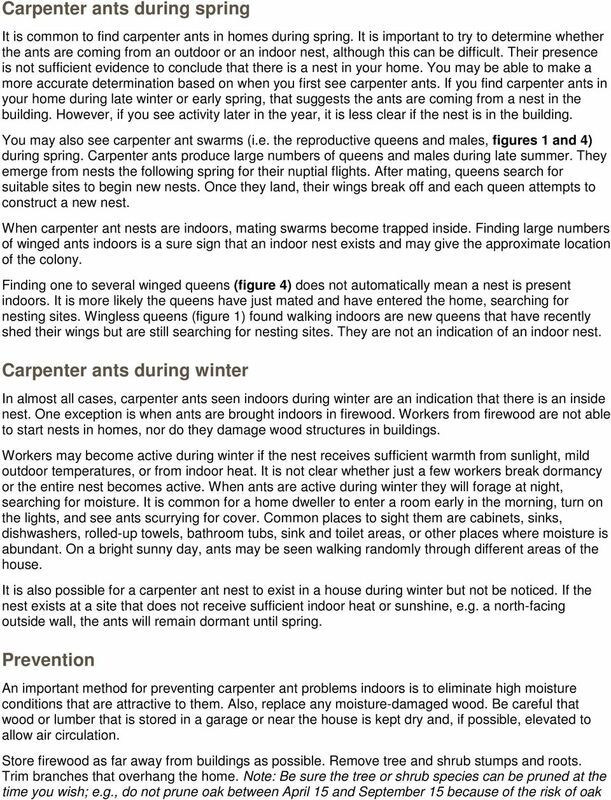 6 Outdoors Often carpenter ant nests found indoors are satellite nests that can be traced back to a parent colony outdoors in trees, stumps, roots, fence posts, landscape timbers, and other wood structures. When possible, remove wood that contains carpenter ant nests, or destroy the colony. When this is not practical, and carpenter ants have been discovered entering your home from outdoor nests, a treatment with a residual insecticide around the building s exterior helps keep them out of your home. Products, such as bifenthrin, cyfluthrin, or permethrin, are available to home dwellers. Be sure the product you intend to use is labeled for use around building exteriors. Professional pest control services can also treat your home s exterior. Spray the product in a band, covering the foundation and under the lower edge of the siding to help keep ants from coming inside. Trim branches that overhang buildings or electrical wiring to avoid giving carpenter ants easy access to your home. Note: Be sure the tree or shrub species can be pruned at the time you wish, e.g. do not prune oak between April 15 and September 15 because of the risk of oak wilt. Treating the building s exterior is a short term control measure. A permanent control method is to eliminate or remove the nest. 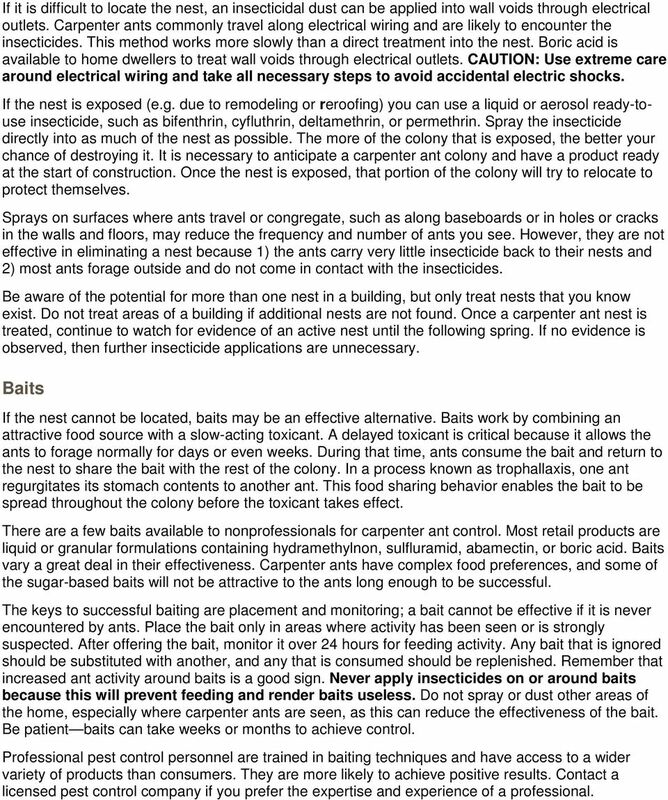 If this cannot be done directly, then use baits to eradicate the outdoor colony. In trees Carpenter ants nest in trees in one of two situations: 1) in rotted, decayed wood or 2) in the center heartwood section of the tree. In neither case are they harmful to the tree. Control is unnecessary for the tree's health, as the ants are taking advantage of preexisting soft, weak wood to establish their colony. Insects, disease, or environmental conditions such as drought are often responsible for weakening and killing limbs or sections of trees. This allows wood rot to set in, which results in wood decay, giving carpenter ants the opportunity to colonize the tree. Carpenter ants use knots, cracks, holes, and old insect tunnels to gain access to these areas. Control of carpenter ants in trees is warranted if there are indications that ants are entering homes from colonies in trees. If there is evidence of this, the best control is to bait the colony. Using insecticides Always read labels carefully before buying and again before using pesticides. The availability and use of particular pesticides may change from year to year. The label is the final authority on how you may legally use any pesticide. 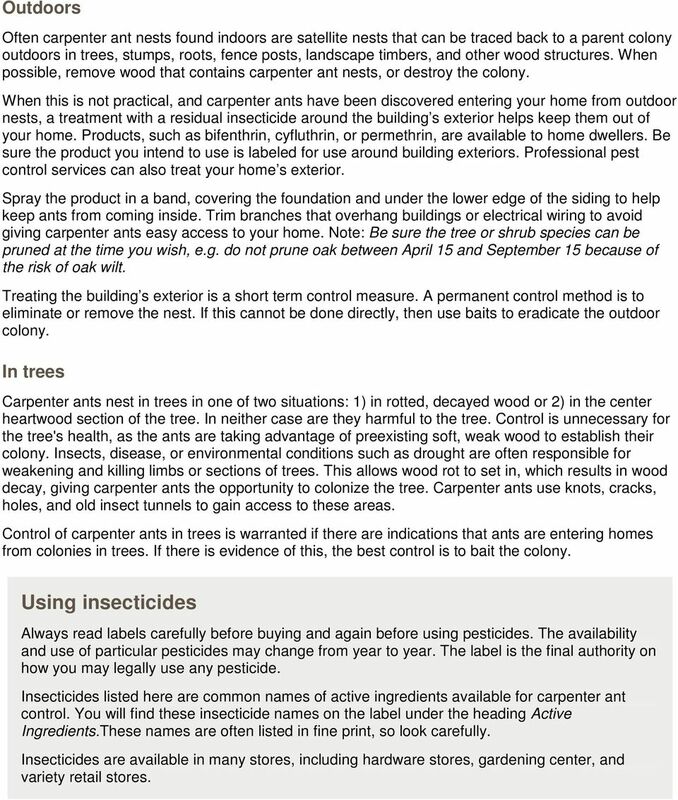 Insecticides listed here are common names of active ingredients available for carpenter ant control. You will find these insecticide names on the label under the heading Active Ingredients.These names are often listed in fine print, so look carefully. Insecticides are available in many stores, including hardware stores, gardening center, and variety retail stores. ANTS. Integrated Pest Management for Home Gardeners and Landscape Professionals. Figure 1. Distinguishing features of ants and termites. Get Rid of Termites ONCE AND FOR ALL Why Bait Is More Effective Than Liquid Treatments Over Time Prepared by: g Home of the All Pest Solution In Arizona, it s that time of year again it s the rainy season. B-6080 1-99 Subterranean Termites House and Landscape Pests Roger E. Gold, Harry N. Howell Jr. and Grady J. Glenn* Subterranean termites are the most destructive insect pests of wood in the United States.